A U.S. Fortune 50's systems interconnect map for 1 division, "core systems only". Enterprise Java Beans (J2EE / EJB's) attempted to make independent callable codelets. Coupling was too tight, the technology too platform specific. Remote Method Invocation (Java / RMI) attempted to make anything independently callable, but again was too platform specific and a very tightly coupled protocol. Similarly on the Microsoft side, DCOM & COM+ attempted to make anything independently and remotely callable. However, as with RMI the approach was extremely platform and vendor specific, and very tightly coupled. MQ created a reliable independent messaging paradigm, but the cost and complexity of operation made it prohibitive for most projects and all but the largest of Enterprise IT shops which could devote a focused technology team (until recently). Prior to SOAP (Simple Object Access Protocol) and SOA (Service Oriented Architecture) one could carefully manage the integration chaos but one couldn’t solve it. And frankly, few IT shops carefully managed it. The picture above is a real picture. 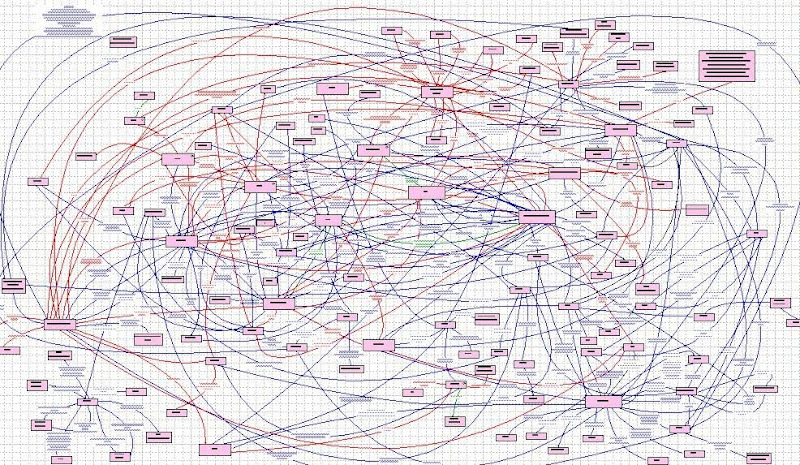 Each line represents a major transaction connection between "core" business systems at a very large IT enterprise. While each individual connection was created in response to a business need as interpreted by the IT systems creators, the overall result speaks for itself.